A beautiful, newly renovated watermill, surrounded on both sides by the Avon River, with uninterrupted views across the water meadows. Exclusively yours, Sopley Mill is a blank canvas providing privacy, and flexibility for you to create your own unique wedding. 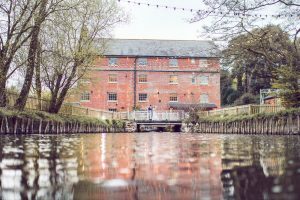 The Mill is licensed for weddings for up to 100 people, and can accommodate another 40 evening guests. There is no corkage charge on wines and we have a pay bar available. We have the gorgeous “Avon Suite” on site for a bride or groom to use to get ready in, and for the duration of your wedding.